The tunneling machine is the world’s largest ever built and was supplied by a Japanese firm, Hitachi Zosen Corp.
Nucor General Recycling installed a 700 Series E-Crane for feeding auto bodies into a shredder at their facility near Jackson. Mulzer Crushed Stone installed a 1500B Series E-Crane for handling aggregate and stone at their facility. This impressive 3000 Series E-Crane® has changed the skyline of the steel mill and is now the heart of the scraplogistics between the port and the steel mill. The average cycle time of the E-cranes is 60 seconds, and peaks of over 1000 wet metric tons per hour are reached. The main reason for choosing this type of crane is the fact that this hydraulic balanced crane can operate with utmost precision plus the high transloading capacity. In 2008 the first E-Crane® was delivered to IÇDAŞ’ Biga steel mill soon followed by an identical unit in 2009. 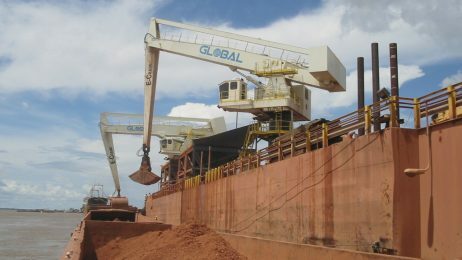 The E-Crane is used for stockpiling the scrap to a height of over 25 meters, necessary to ensure there is enough scrap ready for the loading of Handymax ships. E-Crane provided a proven scrap yard layout and the material handling equipment for improved performance. Seaboard operates grain processing and milling facilities throughout South America, the Carribean and Africa. 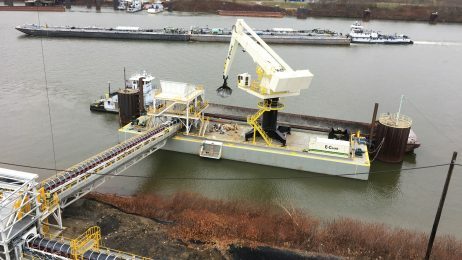 The E-Dredger® features the renowned E-Crane equilibrium principe for smooth, efficient, energy saving operation in a multitude of dredging and related applications. Kinder Morgan needed a state-of-the-art material handler to unload incoming scrap from barges for the new SeverCorr Steel Mill. In July 2007, the 1000B Series E-Crane® was installed next to the 700 Series E-Crane® at the villa Constitución plant. River Metals Recycling replaced several conventional material handlers by the 1000 Series E-Crane, that is now feeding the world’s largest shear. 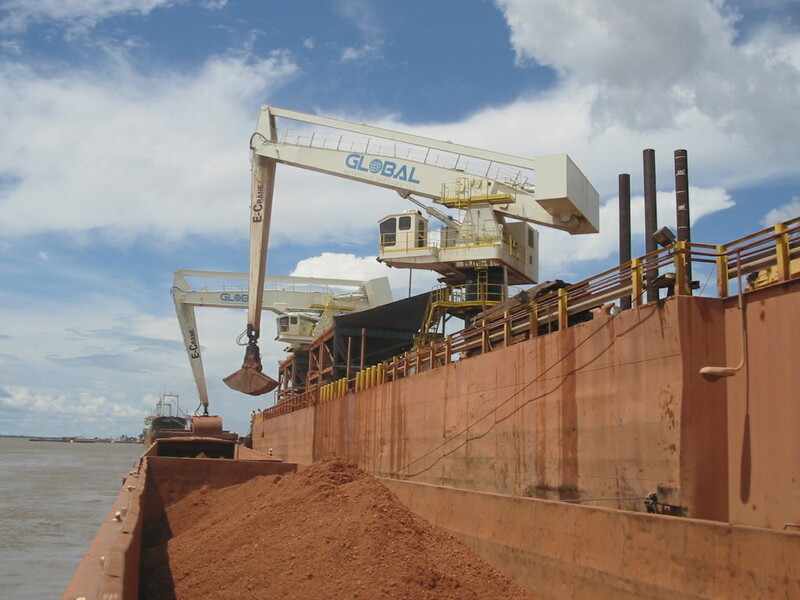 This E-Crane floating terminal consists of two barges (2000 Series E-Crane and conveyor back-up), a hopper, a barge-haul system, and a barge-breasting system. Schelde-Natie replaced an existing grain elevator with an Equilibrium crane to offload vessels and a “bulk-flow system to discharge rail cars. For Harsco Metals’ scrap management project at Arcelor’s new stainless steel mill, two 1000 Series E-Cranes have been working simultaneously at the Ugine & ALZ Carinox site since 2005. Cargill Fertilizer has purchased a second new E-Crane® that was installed in April 2001 at its Houston Ship Channel facility. 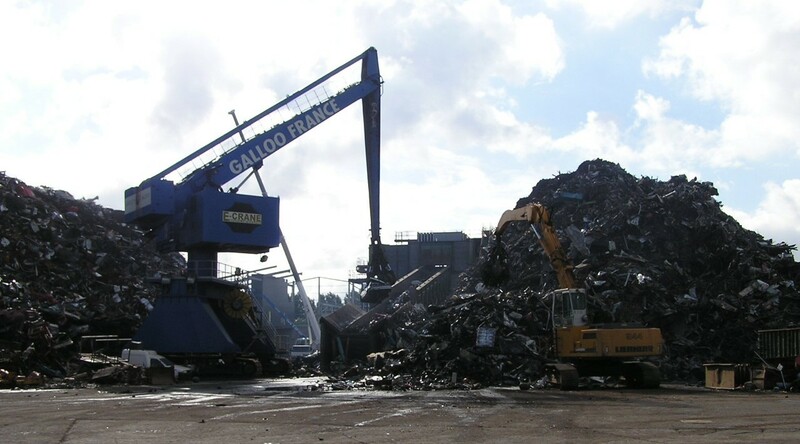 This 1000 Series E-Crane is used to feed a shear at the scrap yard in Menen, Galloo Group. This bulk handling E-Crane offloads a full 1800 ton barge, including clean-up, in less than 2 hours. This 1500Series E-Crane is used dockside to unload bulk commodities. 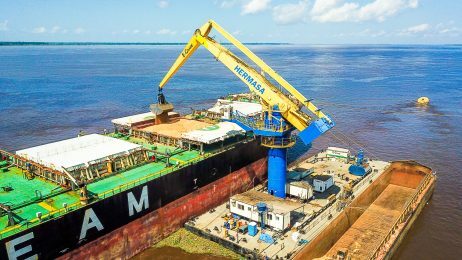 The crane’s primary duty is the processing of stainless steel scrap and for loading and offloading of both inner waterway and sea going vessels. The Cargill Fertilizer facility in Savage Minnesota needed to reduce operating costs and increase the volume produced by their barge offloading operation. 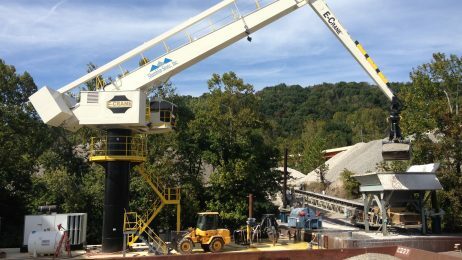 This 2000 Series E–Crane towers over the banks of the Monongahela River, handling coal and other bulk materials. When new emission laws mandated B&N Coal to blend low-sulfur coal at this plant, they explored several options on how to most efficiently meet that requirement. This E-Crane®, installed in the 4th quarter of 1998, was the first barge mounted E-Crane® to be sold in the United States. The E-Crane not only offloads barges and feeds several hoppers, but the increased reach and stock-out capacity eliminates the need for additional hoppers and conveyor belts. The crane’s principal functions are to feed a bailer, stockpile and sort scrap and load out bails.